The Basilisk-R is the long awaited successor to the legendary Basilisk that was originally released in 2007. Created from the ground up in an all new design, the Basilisk-R incorporates new features such as precision tolerances and detailed machining while retaining styling features from the original. The handles on the Basilisk-R are available in carbon fiber, blue twill, and G10 overlays over titanium liners, or full titanium handles on the Titanium Basilisk-R. Handle design features include chamfered slots and holes, combined with horizontal jimping for added grip that will not interfere with fanning techniques. The Basilisk-R recurve bowie blade is 154CM and includes a CNC chamfered spine, tang, and horns. The blade mechanics are supplemented by a precision tuned bushing system that creates virtually no blade-play even after extensive use. The Basilisk Elite upgrades the blade steel to S35VN and includes an extremely durable Titanium Nitride (Ti-N) and gray/black PVD coating. 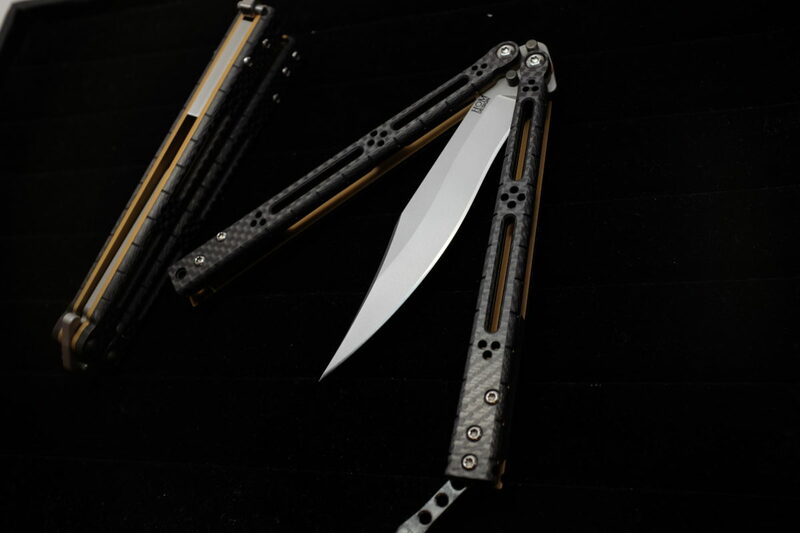 The Basilisk-R Balisong is manufactured in the USA.